"It's classic encounters of the funniest kind!" 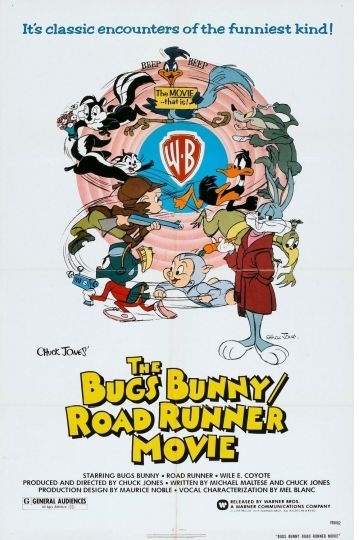 “Road Runner Movie” is the follow up to “The Bugs Bunny Movie” and consists of a 15 minute long segment featuring the Looney Tunes characters Wile E. Coyote and the Road Runner. The two movies were originally part of one single movie compilation of cartoons called “The Great American Chase.” In the “Road Runner Movie,” Wile E. Coyote, a lanky, anthropomorphic coyote capable of engineering complex plans, valiantly tries to capture the object of his obsessions, a blue cartoon version of a roadrunner bird known simply as the Road Runner. Wile E. Coyote appears to be constantly famished; thus his attempts to catch and eat his prey using increasingly ridiculous inventions and ideas. Wile E. Coyote demonstrates an incredible genius in the elaborate set ups and inventions that he employs in his plots to catch the Road Runner. He often orders equipment, weapons or tools for his plans from the Acme Corporation. Unfortunately for the Coyote, his schemes almost always backfire on him, literally. Throughout the movie he does not give up on his goal and seems unable to be distracted by anything else. Despite his intentions towards the Road Runner, the Coyote garners the sympathy of the audience for his determination and humorous ingenuity. The Road Runner is a bird of comparable size to Wile E. Coyote and constantly seems to taunt him by remaining elusively just out of reach. The Road Runner is capable of running at incredible high speeds along any road in their southwestern desert environment. The Road Runner is notably a junior character to the Coyote; his actions mostly consist of running ahead of the Coyote and “beeping.” He remains free throughout most of the movie. Chuck Jones was involved with directing, producing, and writing the cartoons. Phil Monroe aided in direction and Michael Maltese was also a writer for the cartoon gags. Ben Washam and Maurice Noble worked on the animations and backgrounds.